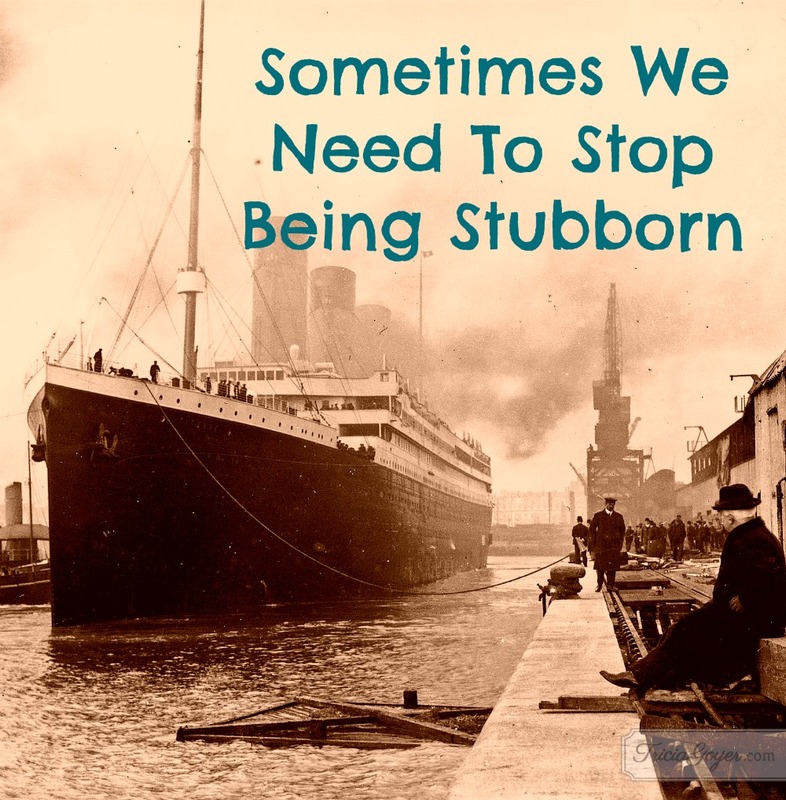 Have you ever been stubborn? Stubborn about parenting, a schedule, or activity, or method of discipline that doesn’t work? I’m sure you haven’t. Maybe it’s just me. But if you’ve been stubborn just once you might want to keep reading. It’s easy to be stubborn. We put time into figuring out what will work…and then we’re disappointed when it doesn’t. We want the ideas in the blog posts, or books, or the advice from a friend to work. We want our kids to respond like those “normal” kids out there. I was thinking a lot about being stubborn when I was writing my novel about the Titanic, By The Light of the Silvery Moon. Talk about some stubborn people. One could not blame the steward for being stubborn. The Titanic was a modern marvel. It boast of the latest technology (elevators on a ship!) and it had safety features that were unheard of at the time. The truth was the Harland & Wolff Shipyard and the White Star Line knew there were some scenarios that could sink the ship, but they were rare. They knew that yet they still gave the marketing department free reign of the Titanic’s unsinkability. Stubborn. The captain was a little stubborn too. Captain Smith had a record to break and influential passengers to cater to. Could you imagine the praise he’d receive if he made it to New York in record time? The folks in first-class were some of the wealthiest in the world, and he would be their hero. Of course I don’t want to give the marketing department or Captain Smith a hard time. It’s easy to speak of these things now…because we know the end of the story. My point is: sometimes we need to stop being stubborn. We need to stop marketing a parenting project—or at least point out it’s flaws. We also need to stop seeking praise for our efforts, when we really need to pay attention to the warning signs. We also need to keep our minds and hearts open for any important messages that are trying to come through. “Less than an hour before Titanic was to collide with an iceberg, Californian’s wireless operator, Cyril Evans, tried to pass along a message from her captain warning that Californian was surrounded by ice and stopped. On board Titanic, Phillips (one of two Titanic wireless operators working for Marconi Company onboard to relay commercial messages) was busily sending commercial messages, and replied, ‘Shut up, shut up, I’m busy….’ Ten minutes before the collision, Evans, noting that Phillips was still busy with commercial messages, shut down his equipment and retired to his cabin” (Landesberg, 2001, p. 54). If you’re being stubborn, you might need to pay attention to what’s really not working. But even more important, study God’s Word and listen for His still, small voice. Proverbs 14:15 says, “A simple man believes anything, but a prudent man gives thought to his steps” (NIV). Have you given thoughts to your steps lately? Do you need to? If not, pray and ask God to help you do just that…and then shut down all the commercial messages before it is too late. Antonyms of stubborn are: meek, tame, and yielding. And for God there is no better way to approach. Taking time to heed warning and be aware of our weaknesses will not only save us from sinking, but with God’s help, it’ll keep our kids afloat, too. God give me the sensitivity of heart and mind to release being stubborn and to re-think the things in my life that are not working. How do I need to change?